Tag Archive | "credit card fraud"
A Greenville woman was arrested last week after she picked up someone’s credit card and used it to pay for phone calls from an ex-boyfriend who was in jail. According to the Montcalm County Sheriff’s Office, the owner of the credit card had mistakenly left it at a restaurant in Greenville. The suspect, Monique Megchiani, 38, of Greenville, found the card. She had been receiving phone calls from her ex-boyfriend, who was in the Van Buren County jail. She was prompted to enter a credit card to pay for the calls, so she used the card to pay for the incoming calls. Megchiani was arrested on Wednesday, November 23, and lodged in the Montcalm County Jail on felony possession of a financial transaction device and stealing/retaining a financial transaction device without consent. Her bond was set at $2,500. The Kent County Sheriff Department arrested six suspects in three separate credit card fraud incidents on March 4 and 5, and police are seeking a woman in another case. According to police, the subjects are using stolen credit card information on line to make purchases or reprogramming the magnetic strip on credit cards or gift cards with stolen credit card information and using the cards to make in store purchases. In addition, suspects are using stolen personal information to obtain services/items of value such as cell phones. The first suspect was arrested on March 4, for an incident that happened in Byron Township on January 21. The suspect had reportedly purchased merchandise with a stolen credit card. The investigation over the following month revealed a 27-year-old male from Detroit, Deandre Calhoun, made purchases from at least four businesses in Kent County using stolen credit cards. After his arrest Kent County detectives, with the assistance of the Detroit Police Departments, searched a couple of houses in the City of Detroit. Detectives located property such as a sofa, TV, and collectible coins from victims in Kent County. They also located hundreds of credit cards, credit card numbers, social security numbers, and people’s personal information, along with equipment to encode the magnetic strip on credit cards in the houses. The suspect is believed to have purchased or attempted to purchase over $40,000.00 worth of property from Kent County businesses and is believed to have made purchases with stolen credit card information in excess of $100,000. He has been charged by larceny over $20,000.00, unlawful use of a computer, and illegal use of a financial transaction device. In another case, Kent County deputies made contact on March 5 with a couple of subjects from the Detroit area at a gas station in Plainfield Township, after they made some suspicious purchases of cigarettes with gift cards. The suspects had several gift cards on them which had the magnetic strip reprogrammed with stolen credit card information. In addition, they had 18 cartons of cigarettes in their vehicle, which are believed to have been purchased with the stolen credit card information. Deputies were able to track fraudulent purchases to at least two businesses located in Kent County. One of the suspects, Willie Coger, a 21-year-old male from Detroit, was lodged at the Kent County Jail and charged with possession of a fraudulent transaction device. In the third case, Kent County Sheriff Department responded to the Meijer store in Cascade Township on March 5, after receiving a call of several people smoking marijuana in the parking lot. Deputies were able to locate the vehicle and made contact with three subjects who were from the Detroit area. During their investigation deputies located a small amount of marijuana. Deputies also became suspicious of possible credit card fraud after locating numerous gift cards, Visa Green Dot cards, 10 IPAD Airs, 4 boxes of shoes, a PS4, a hoverboard, and clothing. Do you know this woman? Police are seeking to identify her in relation to identity theft and credit card fraud in Byron Township. If you recognize her, please call the Kent County Sheriff Department Detective Bureau at 632-6100 Ext. 6 or Silent Observer at 616-774-2345. It was determined the subjects had numerous stolen credit card numbers programmed on the back of gift cards and were using the stolen numbers to make their purchases. The value of the merchandise recovered in the vehicle was close to $7,000.00 and the total credit card fraud the suspects are responsible for is thought to be in the tens of thousands of dollars. The suspects are Desean Porter, 26, and Arthur Jackson, 26, along with 25-year-old Jennifer Harris, all from the Detroit area. They were lodged at the Kent County Jail and charged with possession of a fraudulent financial transaction device. 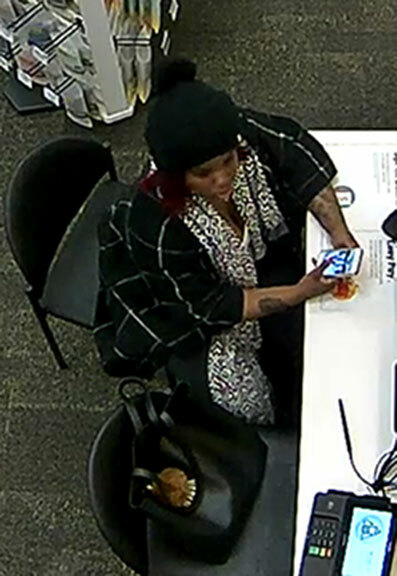 In another incident of identity theft unrelated to the above credit card frauds, the Kent County Sheriff Department took a report on Feb. 6, where a female went to a Sprint store located in Byron Township and used someone else’s identification to open up an account and obtained four Iphone 6’s valued at $2,600. On the same date, two other Sprint stores in the area had a similar female do the same thing at their locations. The suspect is described as a heavier set black female in her twenties. Detectives have not been able to identify the female suspect in this case and are asking anyone that may recognize the person of interest in the attached photo to contact the Kent County Sheriff Department Detective Bureau at 632-6100 Ext. 6 or Silent Observer at 616-774-2345.